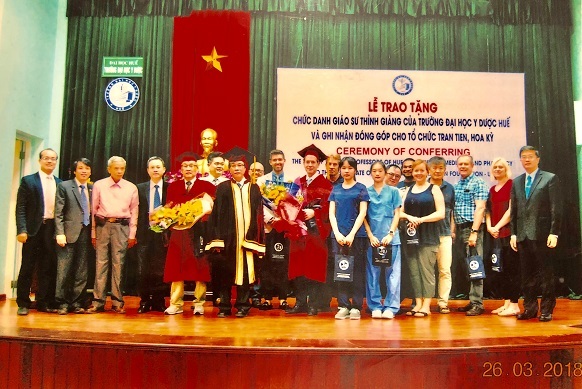 The philanthropic services with many different projects since 2005 have contributed to the development of high techniques to all local health institutions, provided the healthcare to the underprivileged patient and offered the education to children at Hue. 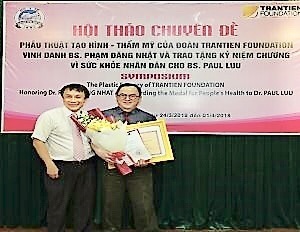 The Ministry of Health of The Socialist Republic of Vietnam awarded The Medal For People' s Health to Sum Tran, MD and Paul Luu, MD on behaft of The Trantien Foundation. 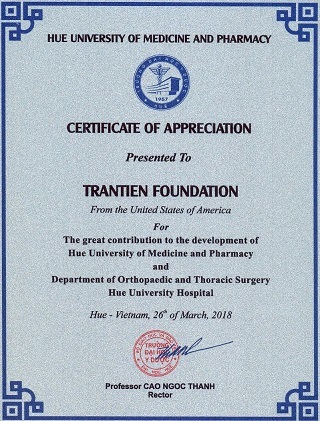 Hue University of Medicine and Pharmacy presented the Certificate of Appreciation to Trantien Foundation for academic contribution for last 10 years. During the period from Aug 2005 to Dec 2018, we have accomplished the following results from Free Clinic Thien Sanh : A total of more than 55.000 patients were seen at the Free Thien Sanh Clinic for community and health care services including western medical care and acupuncture. More than 80% of these patients come from the local district of the Thua Thien-Hue province. From 2008 to early 2019, more than 2000 patients had been consulted for plastic reconstructive surgery and 600 underwent procedures under Project Hue: Cleft lip-palate repair, reconstructive microsurgery, post-burn reconstruction, hand surgery with brachial plexus reconstruction, breast reconstruction, and other reconstructive procedures from trauma ,cancer or congenital deformity. *N/A: Not Applicable because the services were not in place at the time.